About a month ago, I made the dramatic decision to limit my film and television consumption to only women writers and directors. This isn’t out of distaste for male directors and writers. I love movies of all kinds, for countless reasons. I would never allow my opinion of a film or TV series to be influenced by the gender of the creative force behind it. That said, women writers and directors are few and far between. Their struggle for recognition in the industry and the funds to make their films is well-known (although, not well-known enough). Still, even the most ingenious amongst them tends to fade into the background before they’ve weathered a full career. 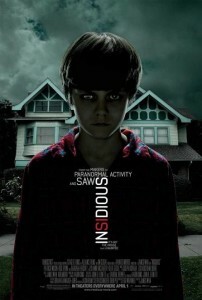 There’s a sense of familiarity in a movie like Insidious. Horror movies these days are a dime a dozen, but Insidious‘s familiarity comes from a deeper place; it comes from true classics like Poltergeist (1982)Â or even Paranormal Activity (2007), whose producers helped get this film done. Those films work because they have a handle on their atmosphere, something every good horror film has. If you can’t control the tone of your film, how can you hope to control the tone of your audience? The answer to that seems easy – that’s why films like John Carpenter’sÂ The Fog (1980)Â get remade, and films like Boogeyman (2005)Â are conceived every day. Tell some audiences to be afraid, and naturally they will be. An example of making your audience afraid, rather than simply suggesting their fear, is a Japanese film called Ju-on (2002), later remade in 2004Â as The Grudge to, arguably, the same effect. An even better example is Alfred Hitchcock’sÂ Psycho (1960).